A region of the brain that extends through both hemispheres, the planum temporale, is larger in the left than in the right hemisphere. In the 1960s, this finding was linked to the hosting of language processing in the left hemisphere, but new research from one of the Human Brain Project’s research partners has shown this asymmetry is not a marker of language lateralisation. 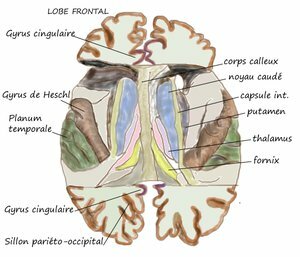 In 1968, when there were no techniques to observe how the brain worked in vivo, the neurologist Norman Geschwind discovered that a region of the temporal lobe, the planum temporale, was larger in the left than in the right hemisphere. As language processing is located in the left hemisphere (for most people), the neurologist proposed this asymmetry was an indicator of the lateralisation of that function. Lateralisation refers to the fact some brain functions are more dominant in one hemisphere than the other. Almost fifty years later, a team of researchers from the European MULTI-LATERAL project, one of HBP partnering projects, has used magnetic resonance imaging to study brain areas in vivo and found evidence to refute the theory. They found the anatomical asymmetry of the planum temporale that hosts auditory functions is not a marker of the lateralisation of language functions. The study, published in the journal Brain Structure & Function, involved 287 left and right handed participants who had to perform several tasks while the researchers analysed their brain activity. Principal author Nathalie Tzourio-Mazoyer, head of the Neurofunctional Imaging Group at the Institute of Neurodegenerative Diseases of the University of Bordeaux (France), said none of the participants showed that planum temporale was a marker of tasks related to language. However, there was a local correlation between the anatomical asymmetry and the functional asymmetry during the auditory processing of speech. "It is the first study with such a large sample of individuals and includes the entire range of language variability implemented in the brain," says Tzourio-Mazoyer. While in most participants the left hemisphere was specialised in language processing, a minority had it inverted and the right side was in charge of these functions. In the few participants who processed the language with the right hemisphere, the results were the same, not inverted as might be expected, which reinforces the hypothesis of the researchers. "The results of the study show that the planum temporale does not explain the rare but strong individual variability of the language domain that exists in humans and, therefore, cannot be considered as a marker of language asymmetry at individual level," they stress. The European MULTI-LATERAL project in which the study is framed tries to give answers to these and other questions related to the lateralisation of language, a process that develops up to eleven years of age. MULTI-LATERAL is a Partnering Project of the Human Brain Project, one of the FET Flagships of Horizon 2020 –the framework program for financing research and innovation in the European Union. Bibliographic reference: Nathalie Tzourio-Mazoyer, Fabrice Crivello and Bernard Mazoyer. "Is the planum temporale surface area a marker of hemispheric or regional language lateralization? ", Brain Structure & Function, November 2017. DOI: 10.1007/s00429-017-1551-7.